Michael J. Fox as the title character in 1985's "Teen Wolf"
The Throwback: Did 'Teen Wolf' need a reboot? As Jordan Bienstock pointed out in his recap, if you looked for any similarities between MTV’s “Teen Wolf” and the 1985 Michael J. Fox movie when the new series premiered on Sunday, you didn't find much. First of all, there’s not even a Bateman sibling. Michael J. Fox played the title character in the mid-‘80s comedy while simultaneously appearing as Justine Bateman's brother, Alex P. Keaton, on the sitcom "Family Ties." 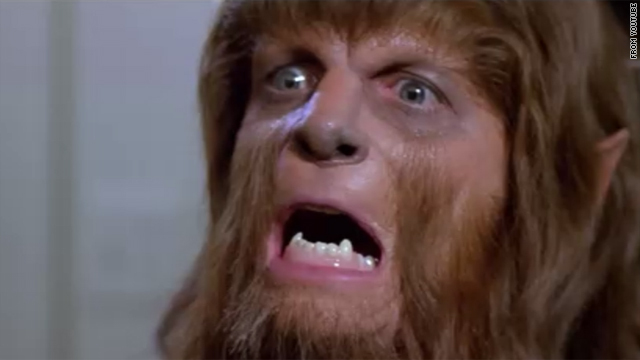 Two years later, Jason Bateman (Justine's real-life brother) starred in the sequel, "Teen Wolf Too." Fast forward almost 25 years and a non-Justine Bateman sibling – fictional or otherwise – has been cast in the latest incarnation of the franchise. To be fair, the new hour-long drama does contain some nods to the original. The protagonist in both the series and the original film is a typical awkward teenager named Scott dealing with high school and life as a werewolf. In both versions, Scott is joined by a T-shirt-wearing sidekick named Stiles. But while the new Stiles wears shirts featuring the Beatles and the Royal Air Force Roundel symbol, the original Stiles favored shirts that included highly-offensive phrases. The 1985 version features Scott reaping the benefits of werewolf stardom. With all his senses heightened, he can be seen getting good grades and the girl of his dreams, break-dancing, bowling a perfect game and surfing atop a moving vehicle when he’s not leading his basketball team to victory. In the MTV reboot, Scott also achieves confidence and acceptance from his peers with his newly discovered powers, however, lacrosse is his game of choice. And of course, a big difference that gives the series its darker spin: In the original, Scott inherits the werewolf trait from his father, who hid his lycanthropy from his son in the hopes that it would skip a generation, while the Scott on MTV's show gets bitten by a werewolf in the woods. What about you? What are your favorite scenes from the "Teen Wolf" movies of the 1980s? Do you prefer the classic movie or the new MTV series? Better be glad a crappy movie is being remade into a top notch MTV series, a first for that network. Teen Wolf is a really gripping and interesting show and I'm glad the series doesn't pay too much homage to its predecessor. I remember loving this movie – as a 10 year old child. Re-watching it as an adult was oh so painful. Awful movie that definitely needs to be put to rest. What is up with "Reboot?" This word is just ludicrous . I loved the original movie, it's a classic. That being said, I also loved the movie Buffy The Vampire Slayer. We all know how that turned out. It was one of my favorite shows on TV. Give it a chance... it might surprise us. "well Dad, it didnt skip a generation...it landed on my FACE!" I always loved the 1985 classic...MJ Fox brought so much to Scotts character. I havent seen the new one, but yea...I try not even look and compare – seems like the new ones always fall short of the high 80s expectations we knew as kids. I dont know if you guys noticed or not but THEY REMAKE EVERYTHING NOW becuase apparently being creative is too hard for movie and show makers now a days. The question is, what hasnt been made into a remake??? This is not a reboot. Its something else all together. Teen Wolf (the original) was not a miniature detective series, it was a comedy about coming of age and what happens when puberty takes itself to the extreme. This New Teen wolf is nothing like the original, its a drama/mystery... things hiding in the shadows etc. Its like Buffy the Vampire slayer 'cept no vampires (at least not yet). I like it, but they should have named it something else and just said that this show was "inspired by" the original movie. Why don't they reboot BARNEY while they're at it, only make him a real dinosaur that eats kids instead. Holywood is in this funk of reboots... a spiderman reboot? an attempted reboot of wonderwoman? GI Joe and transformer movies? Batman begins... Now a smurfs movie.. where are the Thundercats? What's next, dark wing duck? There is already a remake of the Thundercats in the works – a new cartoon version. If you Google it, you can find the trailer. Teen Wolf didn't even need to be made in the first place. And please stop using the term "reboot," it's ridiculous. I THINK THE REAL LIFE TEEN WOLF ONE AND TWO ARE KOBE BRYANT AND DERRICK ROSE. THEY ARE TWO OF THE BIGGEST BALL HOGS THE NBA HAS EVER SEEN. Funny, my 10-year-old son and I watched the original Teen Wolf just last week. I didn't even know there was a remake (or a sequel for that matter). No it didn't. Teen Wolf was just fine and it really didn't need a stupid Twilighted reboot. I don't think it needs a reboot. The original is the best but of course it's the norm now isn't it? Taking classic movies & re-inventing them for the new generations. Personally I don't think anything Michael j. Fox did needs rebooting. FYI the E.T remake is already in the works. I like the new one. I like the 1985 one also. I hope MTV keeps it around. does cubbs dutch oven himself again in the new one...... no?? then its dead in the water. As for "Teen Wolf", it was a small chuckle when I saw it on the tube years later, didn't bother to see it in the theater. Didn't bother to see the new one, the vampires, werewolves and zombies have been done to death (pardon the pun). Reboot, not necessary. But I don't think we need another moody teen "monster" showcase either. Teen angst with excessive facial hair and fangs, please! The original movie wasn't great, but it was fun, this will turn into Twilight with fur. I think cartoon network did this in the late 90s and called it big wolf on campus. Does anyone remember that? I believe the "original" starred Michael Landon and came out in the early '60's. Didn't see that one either! Could have had Michael J make a cameo as Teen Wolf's chihuahua cousin. Hollywood is full of talentless people. Does anyone have new ideas or is this the future? I guess we can expect a cgi Ultraman, Steve Austin, and maybe a new E.T. With all the hacky vampire stuff that's been coming out, why not? I don't think that this is a remake. They just used the overal idea of a teenage werewolf. In fact, I really like the MTV series. If it aint broke dont fix it! original version is the best! It is refreshing to see a vital, modern interpretation of this time honored classic. Exactly. There are too many vampire/Werewolf-ish movies, shows, books, etc. out there. I know these are "what the kids are into these days" but still.... No more vampires OR werewolves! What we need more of is historical fiction and movie versions of classic books ( I'm talking big budget Hollywood). Or perhaps some original ideas. Teen Wolf was one of my favorite 80's movies (the original, not the crappy sequel). It didn't need a reboot, and you can always use werewolves as a general concept without trying to redo something that was already done. Nah, it didn't need a reboot. Nothing does. Re-release old stuff on DVD/BluRay for the older viewers if you must, but give new audiences new material. The first paragraph of this thing is utterly awful. It's like it's trying to be a joke, but it requires too much explanation and isn't even funny to begin with. "As Jordan Bienstock pointed out in his recap, if you looked for any similarities between MTV’s “Teen Wolf” and the 1985 Michael J. Fox movie when the new series premiered on Sunday, you didn't find much." Never should have been remade. Don't remake movies that were perfect the first time. What's next? The new Casablanca starring Ashton Kucher? Sssshhh! Those idiot execs might be listening...creativity is dead, reheating other peoples ideas has become the norm, how pathetic. Casablanca is impossible to remake. It is a classic "old" movie with too many great lines that an average movie sharing the same name and plot would be too terrible! However, if done the right way it could be spectacular, with the right cast, director, editor, producers, writers, and costume designers it could be THE way to entice the younger audiences to watch a classic and compare the two. Heck, I'm a teenager and I know my loyalties lie with the original. Teen Wolf more like a scared puppy! No, Teen Wolf doesn't need a reboot. In fact, it didn't need an original either. The original wasn't bad. It was the sequel and the subsequent TV series that were about as needed as a snapping turtle in a swimming pool of a "nature lovers' " colony. Anybody want a free moustache ride? I just fapped to that werewolf's face. You probably did. Attention seeking moron! "Be warned, however, it’s probably too offensive for most readers." Considering the usual content of the comments on here I would highly doubt that. Can we loose the word "reboot." Its too ghetto. He didnt even say anything that offensive! I'm offended! Regardless of whether or not you believe a movie NEEDS to be remade, remakes (or reboots/re-imaginings, if you prefer) are always going to be here, so it's probably best to just judge them on their own merits (or lack thereof) and call it a day. Flapping your gums won't change it. And by the way, "Teen Wolf" (1985) isn't a "classic" just because it's 26 years old. It was a steaming pile back then and it remains a steaming pile today. I think we went to go see breakfast club instead.